For dessert, here is another traditional southern fare. I used the recipe on printed on the box of Nabisco ‘Nilla Wafer Cookies. CUSTARD: Mix 1/2 cup sugar, flour, and salt in top of double boiler. Blend in 4 egg yolks and milk. Cook, uncovered, over boiling water stirring constantly until thickened. Remove from heat and stir in vanilla. MERINGUE: In another bowl, beat egg whites until stiff but not dry; gradually add remaining 1/4 cup of sugar and beat unti stiff peaks form. ASSEMBLY: To assemble, spread a small amount of the pudding on the bottom of a glass dish; cover with a layer of wafers ad a layer of sliced bananas. Pour 1/3 of custard over the bananas. Continue to layer wafers, bananas and custard to make three layers of each, ending with custard. Spoon the meringue on top of the custard spreading to cover the entire surface and sealing well to the edges. BAKE: Bake at 350 degrees F for 10-12 minutes or until meringue is lightly browned. Cool slightly or refrigerate, and serve. For us, I doubled the recipe as the kids and the hubby always like to have leftovers. If I make one batch, it is only good for one sitting. You’re welcom, Anon! I hate those boxed jello puddings too, especially the instant, no-cook ones. Yuck! 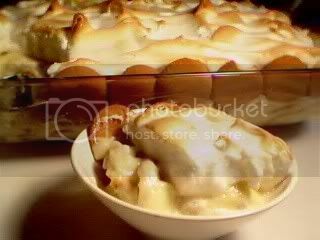 I’ve actually used this pudding recipe for other recipes that call for pudding, and it is great! thank you! my husband threw out the box with the recipe. I can’t believe how many other sites use packaged vanilla pudding. yuck! this one is the one and only. the best. aaaah! 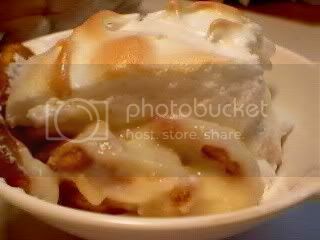 i love banana pudding–i used to always order it when i was visiting friends in the south. looks wonderful! Manang, this is so simple to make, and the kids love assembling the whole thing. I bet your boys will like making this. The Clone, my youngest, is having a unit at school about how things change, e.g. liquid to solid, etc. So whipping up the egg whites to the meringue state was a great learning tool. Your house is coming along so nicely! No wonder, since your hubby gets so much help from you. I don’t tell my hubs about you helping yours, cause he will just say, now why can’t you be like that, see she can even sand wallboards! 🙂 he he! Hmmmm…this looks so yummy!…I should try this soon. Oh darn! I wanted to browse some recipes, consciously trying not to linger too much bloghopping, but oh my! I can’t help it. gotta clean some sidings first…will go back to blogworld later tonight, I hope.